This camera would be nothing if it wasn’t portable. In the past, I’ve gotten pretty far using off the shelf enclosures, no enclosure at all, or even shoving my circuit into someone else’s enclosure, but that wasn’t going to fly this time. The printer module had some nice mounting features and I happen to own a CNC machine, so there was no excuse to not make a custom enclosure. The last time I tried doing this was for my light up earring project (say, that was almost a year ago! ), and I’ve learned a lot since then. 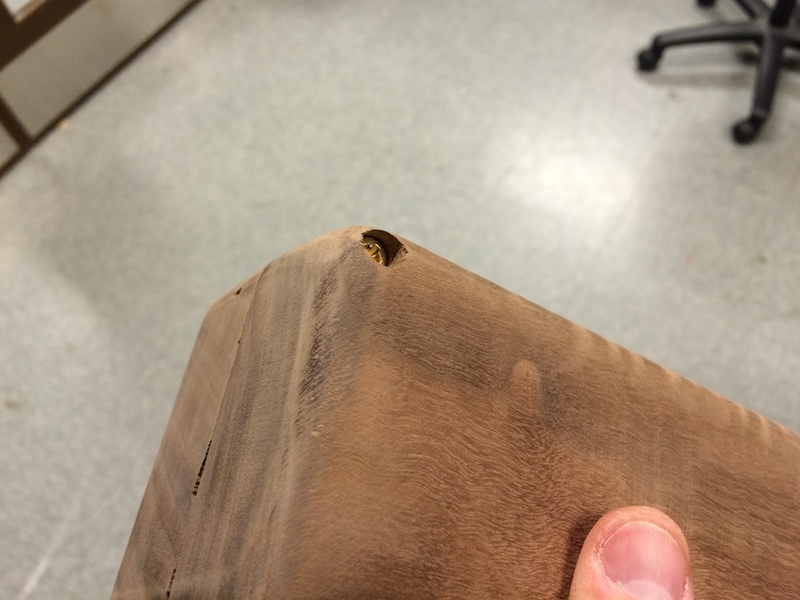 Frist of all, about 99% of the work when using a CNC is finding a way to bolt down the thing you’re trying to cut. This was particularly impossible for the earrings because they were so darn small. 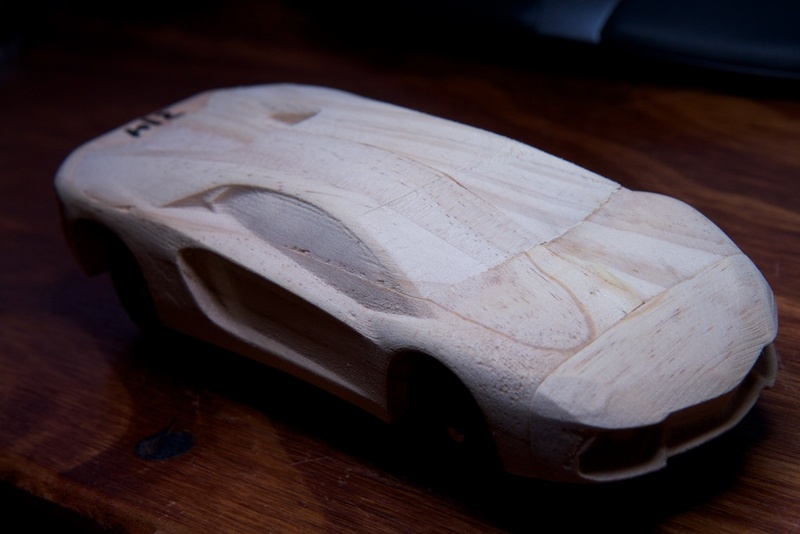 Secondly, it’s best to start a design with CNC in mind. 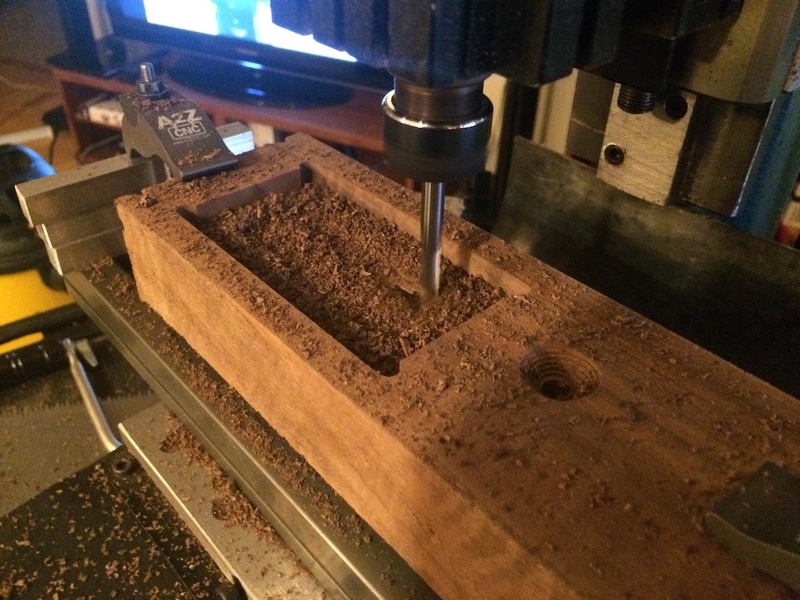 CNC bits can only go so deep, and there are some angles you just can’t cut on a three-axis machine. 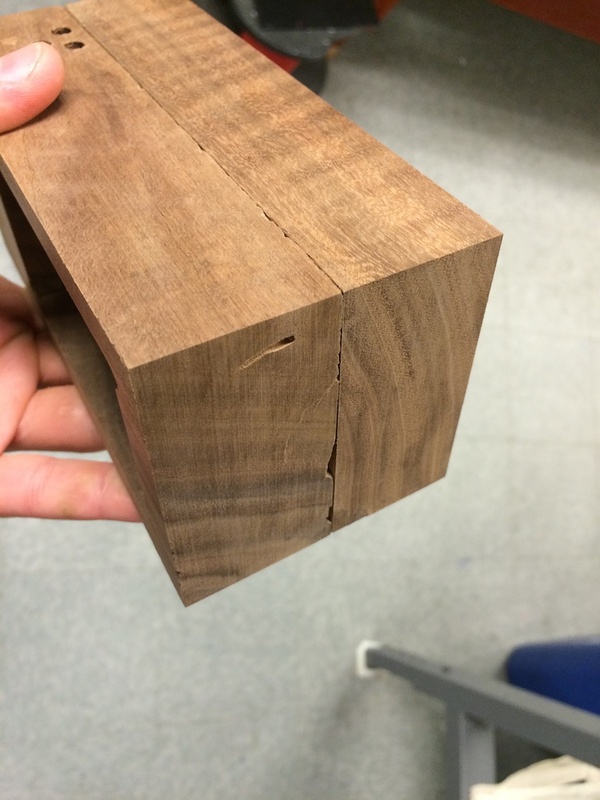 Furthermore, inside corners always end up rounded. 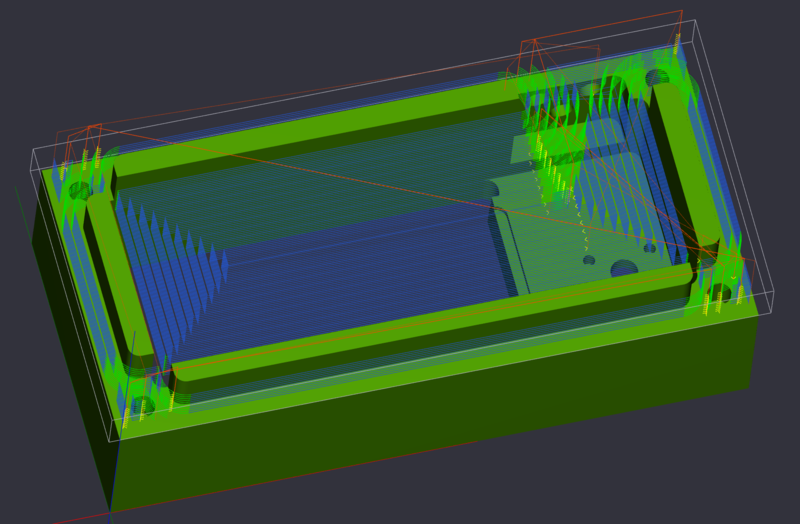 This design was large enough that I was able to limit myself to my 1/4″ bit which is great because the cutting surface is the same width as the shank. This lets me cut down vertically a number of inches. With some bits, the shank is wider, so it gets in the way when you plunge deep enough. Thirdly, mating surfaces should be designed to have very very little space between them. 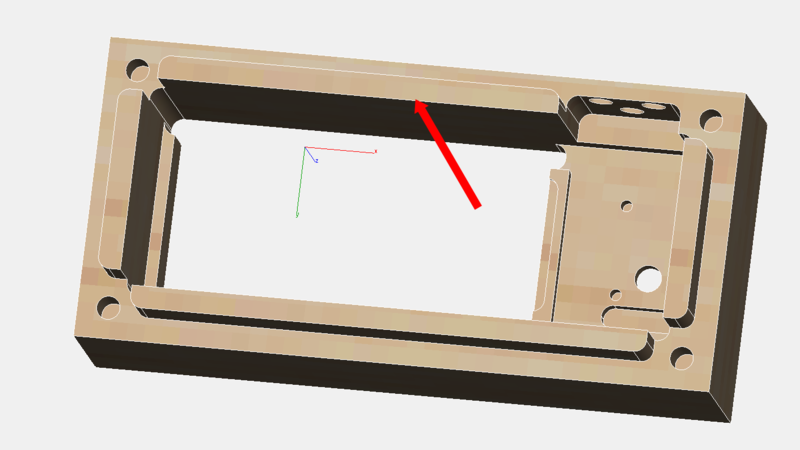 In the past, I’ve assumed that the surfaces between, say, the lid of a box and the box itself needed about 0.1mm of gap between them in order for the two easily connect and disconnect. I learned during my earring experiment that 0.1mm is actually very large. Because I was using wood this time around which is a soft and easily modifiable material, I opted to leave a 0mm gap between the surfaces. 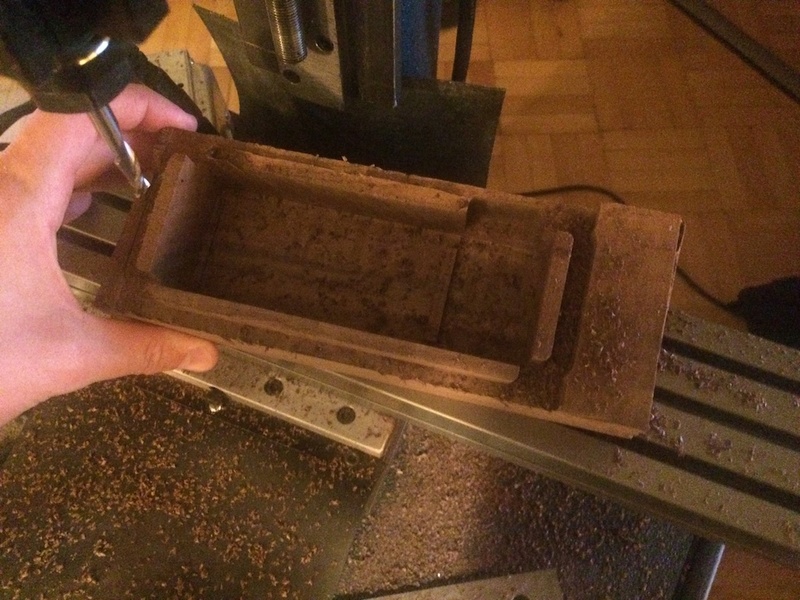 If the box had trouble closing, I could always sand down a few microns of material. I never did have to sand it. 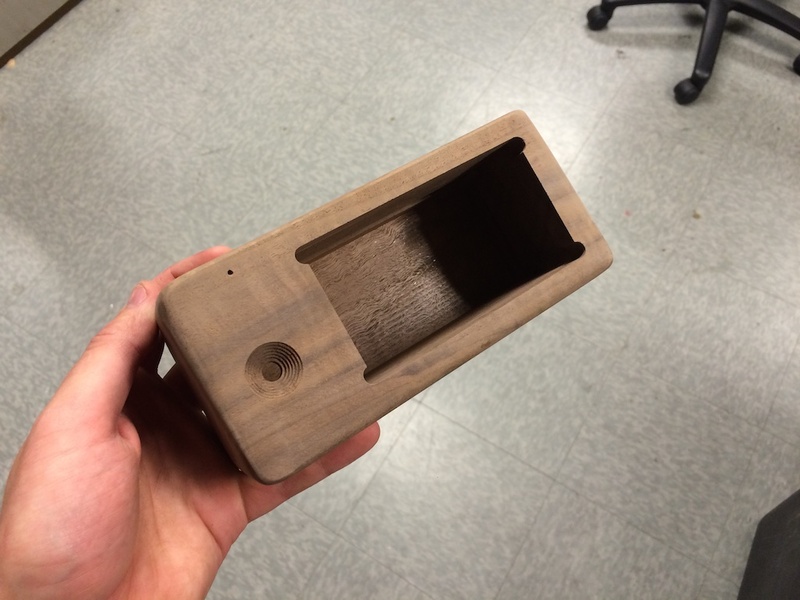 Finally, get your stock small before you start CNC. 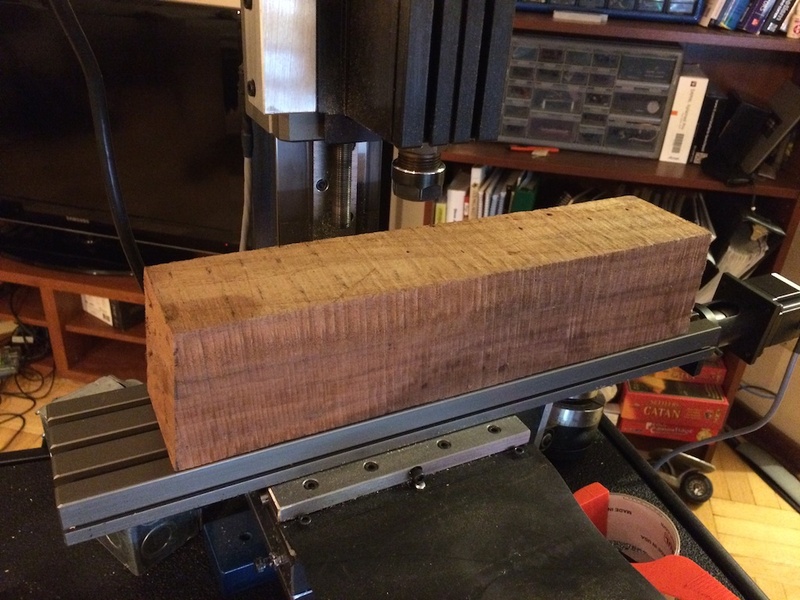 Technically, a CNC mill can trim stock down from any size that will fit on the table, but removing an inch of material a few mm at a time across the entire surface takes forever. 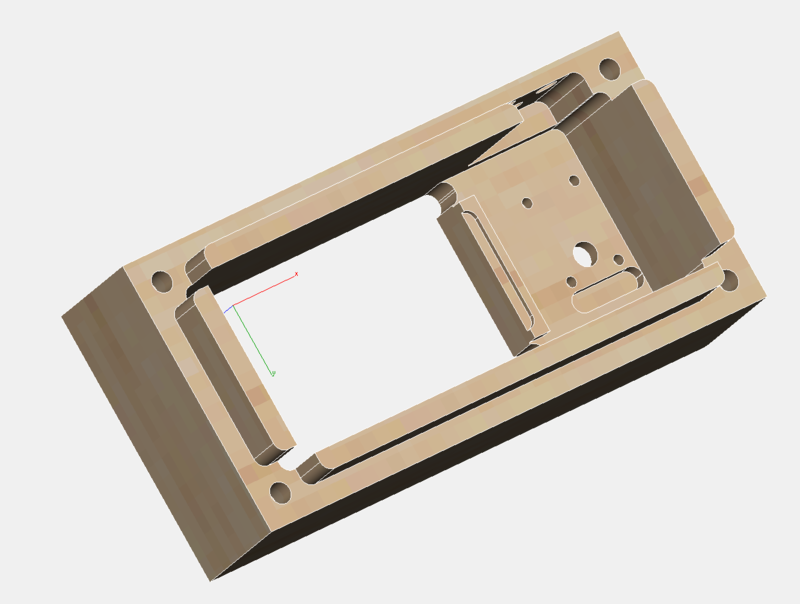 I still don’t trust my CNC skills enough to leave the machine alone, so there were many nights where I’d end up sitting through 45 minutes of milling through the extra stock just to find an error immediately upon starting the actual model. You can burn through a lot of weekends like that. I’m pretty proud of how the printer module came out. I built the computer model using the physical model as a reference, and it’s a pretty good likeness. I’m getting better with ViaCAD. It was only after completing this model that I realized that I had already broken one of my rules. There is no way for a 3 axis CNC to do all of these features at once. While most of the details are on the inside of the front cover, the hole for the camera would have to be cut as a separate process. More importantly, the holes in the top and side for the UI elements and charger port would need to be additional actions. 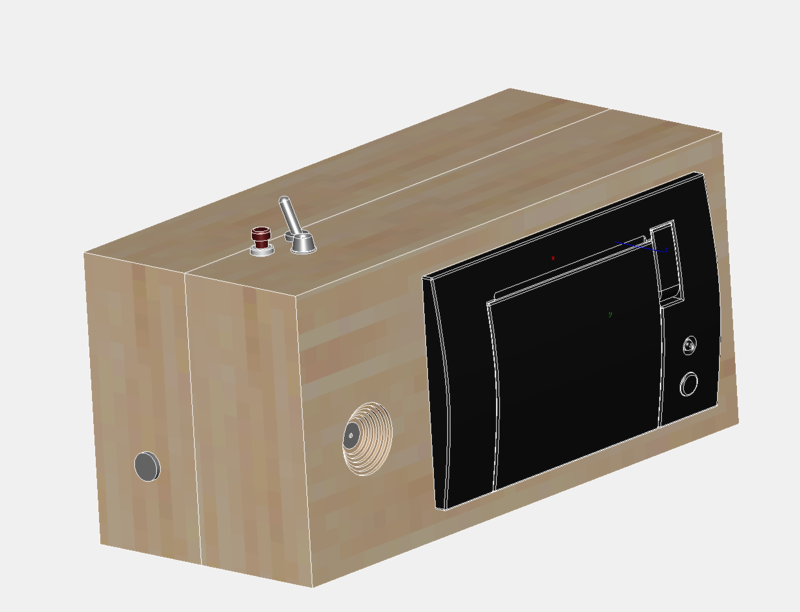 My CNC isn’t even tall enough to drill the charger port since the box would need to be stood on end, so that one at least would need to be done by hand. I resolved that this was all possible; it would just require some planning. Step one was finding some stock. As you’ve already figured out, I settled on wood. Walnut to be exact. When I started, I knew that metal would be ridiculous, and I had trouble finding a good price on a large chunk of millable plastic. 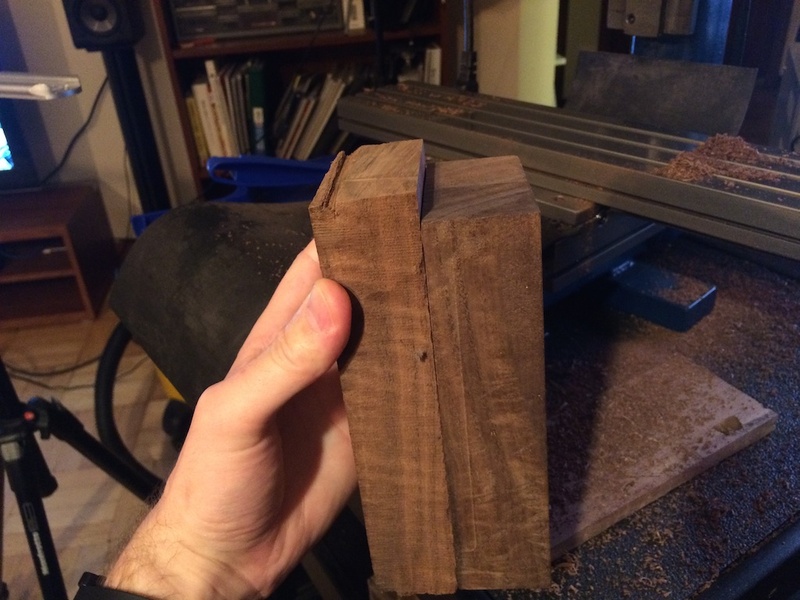 Instead, I drove down to the local woodworking supply store and bought some walnut blocks out of the scrap bin for $8/pound. That’s a big block of wood. So big in fact, that none of my clamps were big enough to hold it. Because the stock had more material on the sides than what I needed, I sacrificed some of this material and used a saw to cut some grooves that gave me a good spot to grip with a clamp. The next morning, I cut a good half-inch or so of wood off the top with a hand saw. It may not seem like a lot, but even with big step heights, my largest bit (1/4″) takes a long time to clear off that much material. It was at this point that I actually measured the blocks of wood and found that they were about 2mm too narrow for my model. My 3D model has wall thicknesses of about 10mm though, so I figured I had plenty of extra space to work with. After all, all of the important mating and mounting features were on inside. Because I was dealing with wood, I could cut, sand, and buff out any imperfections on the outside surfaces. You’ll notice that there are supposed to be four mating features sticking out of the back of this part to mate with the other half of the camera. The top feature is missing from the finished part. This is where I learned something really interesting about CAMBAM. CAMBAM is the software I use to convert STL files (3D models) to tool movements that the CNC machine can understand (gcode). There are a bazillion algorithms that can be used for this process, but the best that CAMBAM has to offer is “waterline”. This involves removing material one layer at a time moving from top to bottom. 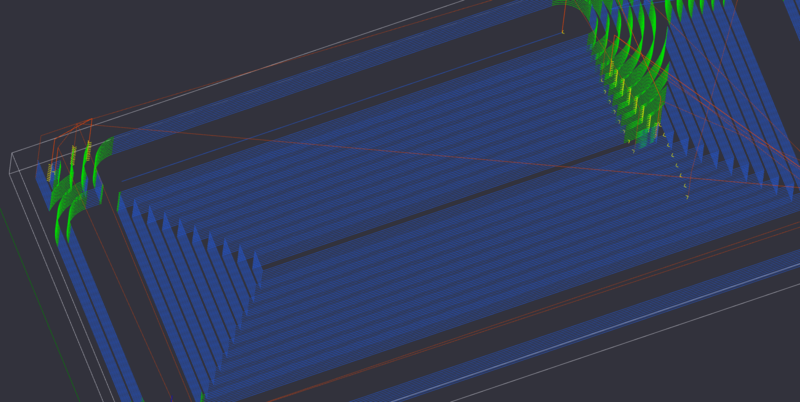 It even has some optimizations which can make this go pretty quickly (for example, if there is a small hole, it will finish the hole to its final depth before moving on to similar depths in other areas). The biggest problem with waterline is that the vertical resolution is directly proportional to cut time. If I have it set to remove 1mm of material at a time, the best level of precision I’m going to get in the vertical direction is 1mm. If I decrease this “step size”, it takes that many more passes to remove the material. This is a cross section of a piece with a large flat surface. 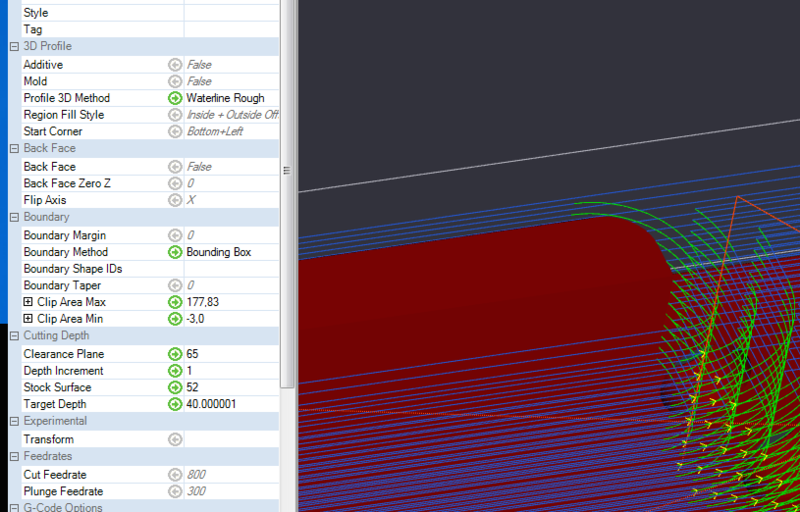 The dotted lines represent the step size of the roughing pass. As you can see, the rough version doesn’t have the correct height on the platform. When the finishing pass goes through, the tool only focuses on the outer edge of the removed material. As a result, you get a beautiful vertical surface cut to the right depth, but you still have a bunch of material left in the middle. This gives you a sort of channel around the platform that’s as wide as whatever cutting tool you’re using. Unfortunately, CAMBAM isn’t smart enough to solve this out on its own, so you have to to coax it along. One method I came up with was to split the job into multiple tasks. 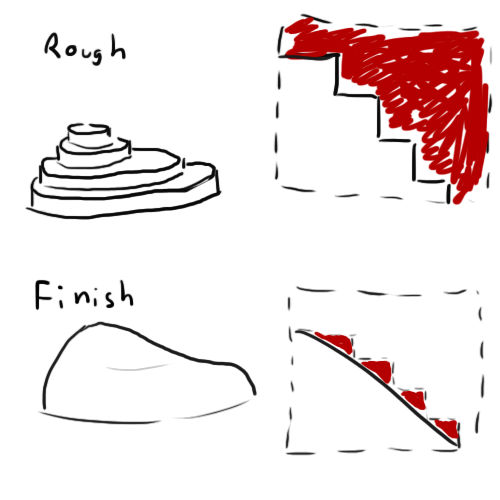 Though the step size might not be precise, the target final depth for the task is always exact. 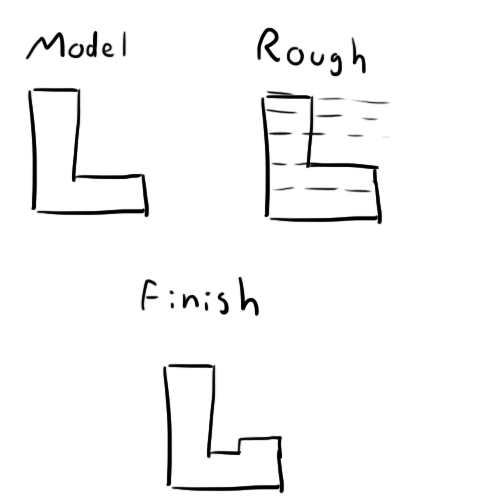 Taking advantage of this, I made a separate task for each of the major large flat surfaces of my model and set the target depth to exactly the height of the associated surface. Sure enough, CAMBAM decided to not only plunge the tool into this feature, but to move it down the length and completely disintegrate it. It’s subtle, so I missed it until it was too late. 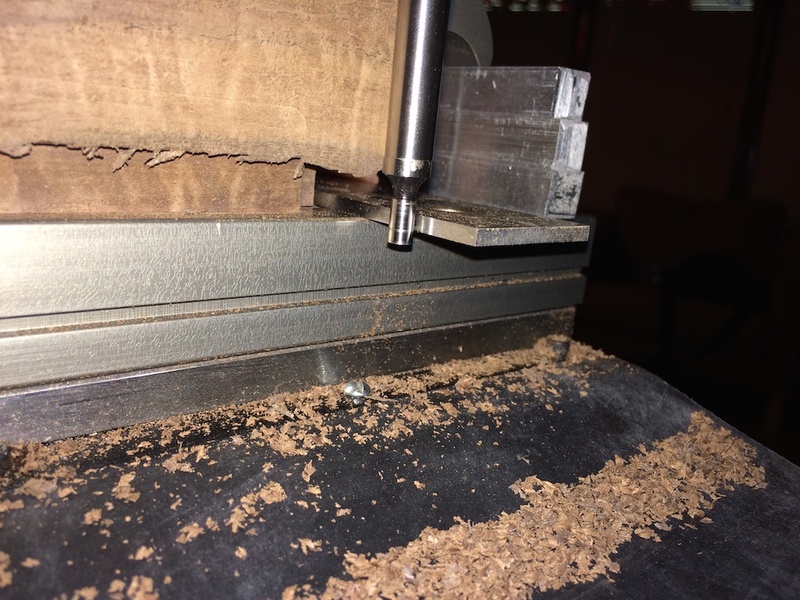 Since I had split the CNC job into separate tasks, this first section had a final target depth of 40mm from the table which should be perfectly level with the flat surface surrounding the mounting features. Changing that final depth from 40mm to 40.000001mm solved the problem. My guess is that there’s some kind of floating point bug in CAMBAM that makes it freak out when two numbers are exactly the same to infinite precision. Despite the small heart-attack I felt when my hour long CNC job started blowing big chunks of wood everywhere, the other three mating features were enough to keep everything aligned, and the extra space actually helps a little during assembly. With the inside now cut, it was time to cut the lens feature and complete the printer mounting hole on the other side. 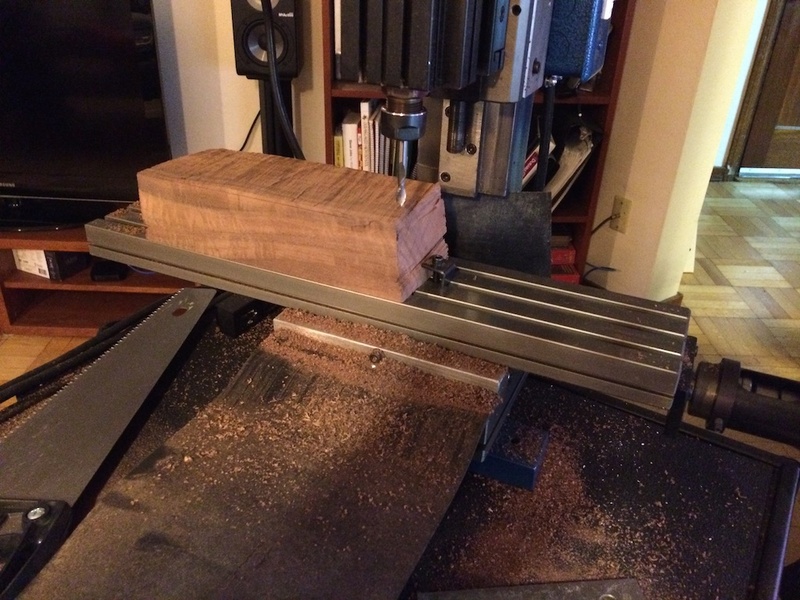 I flipped the piece over and carefully aligned its long edge to the edge of the CNC table to make sure it was square. The piece was now just short enough to fit under my clamps. The biggest challenge with doing multi-sided CNC is telling the computer exactly where your piece is so it knows where to start. Eyeballing it is never a good idea. Because I had flipped the piece over, there were no precision elements exposed on top that I could use for alignment. 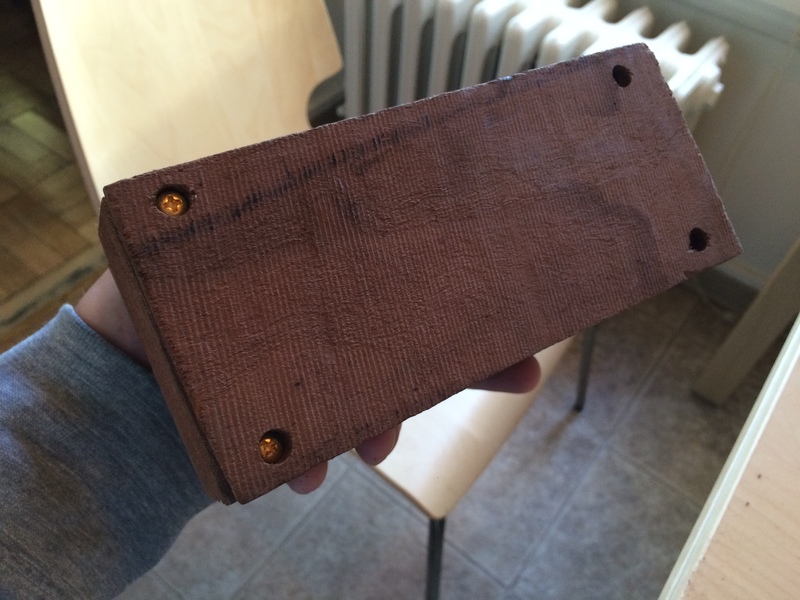 It was all uncut wood left over from the original scrap. 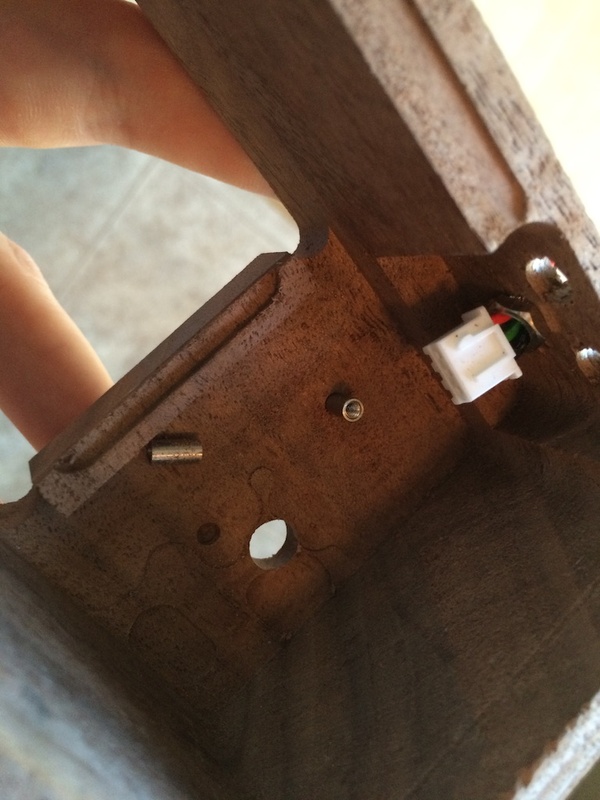 Using a parallel, I was able to align my edge finder with one of the mating features on the bottom of the piece. That got me the X dimensions. For the Y dimension, I used the edge of the table which I had already aligned to the piece manually. I set zero Z to be at the level of the table. All things considered, it came out very well! Like I said before, all the precision is on the inside surfaces, so I had a lot of leeway on the outside. Using a saw, I cut down the excess a little bit and started adding features. I planned to do a crazy amount of belt sanding once I had the whole thing put together. 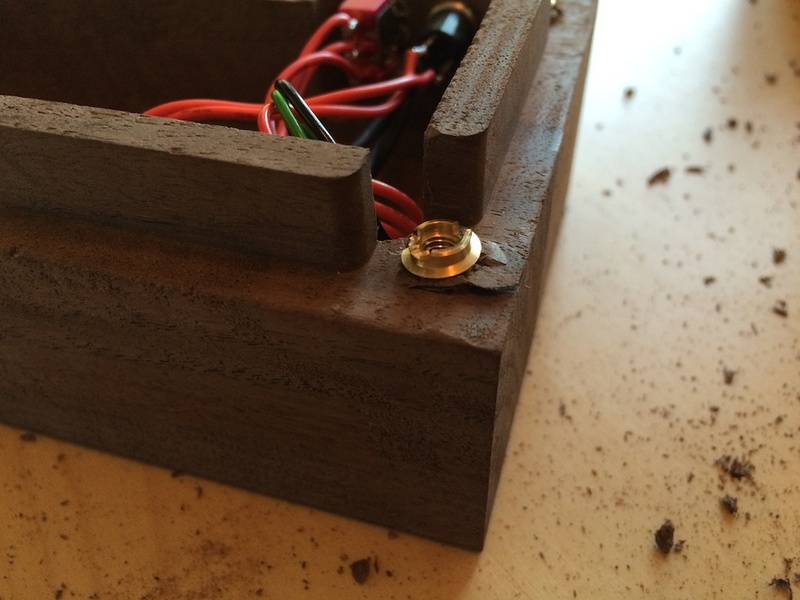 I started with the easy stuff like drilling holes for the button, LED, and switch. The positions of these weren’t super critical, so I did a bit of measuring and mostly eyeballed it. Of the four, I only got one to go in all the way and sit flush with the surface. These things are a little overkill anyway, so what few threads sunk in were more than enough. I just countersunk the holes in the mating piece to accommodate them, and the two halves fit together well. The holes for these threaded inserts were large enough to cut with the 1/4″ mill bit I used for everything else, but the holes in the mating side I had to do after the fact by hand. Aligning holes is always a scary experience, but it was pretty trivial in this case. 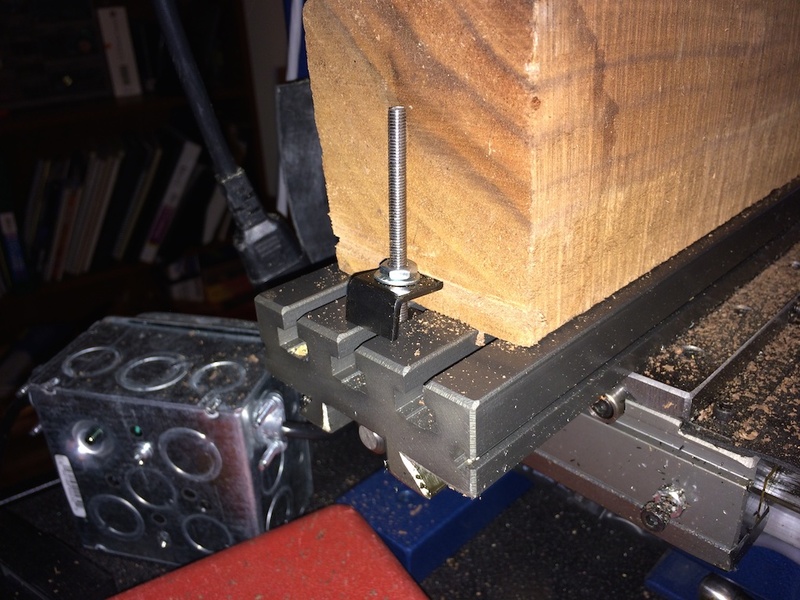 I aligned my drill press head with the threaded inserts and clamped the piece down. Then I simply mated the second piece snugly to the first and let the built-in alignment features align the hole. 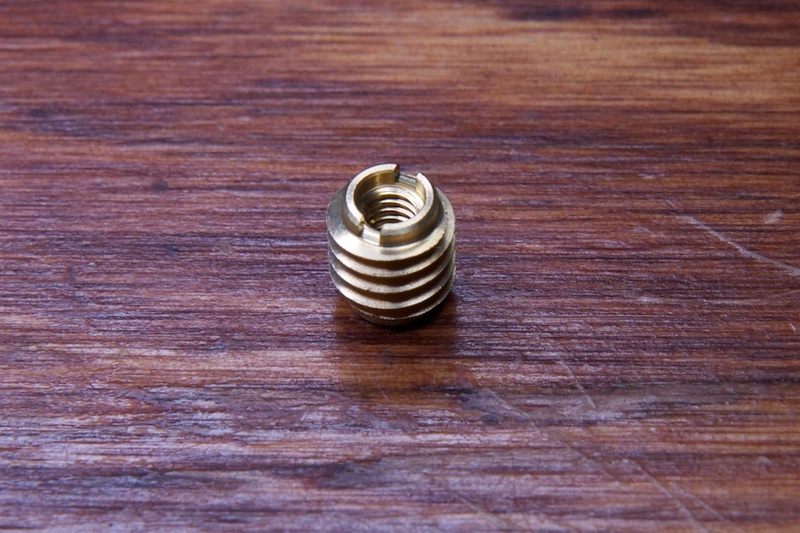 To secure the optical module in place, I used a different threaded insert that had no outside threads. 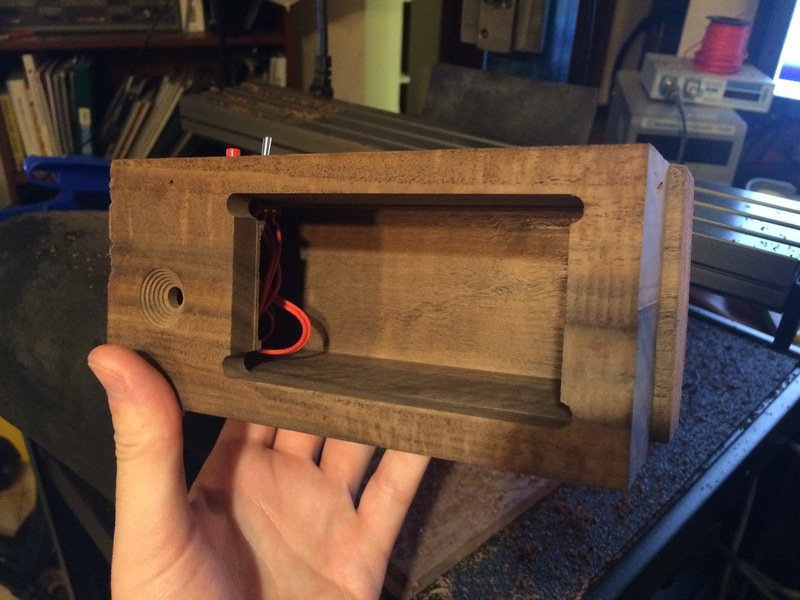 The camera’s lens feature fit snugly in the hole I had drilled for it, so it held itself in place while I marked and drilled holes to a precise depth. A little dab of super glue, and I had the mounting bosses in place. I could only get two of them in there as I couldn’t get my drill press that close to the edge of the box, but two is more than enough. Here it is halfway done. If I do this again, I don’t think I’ll use the same threaded inserts for the case screws. A little bit of glue goes a long way when there’s so little stress on the enclosure, and the regular inserts were a lot easier to work with. 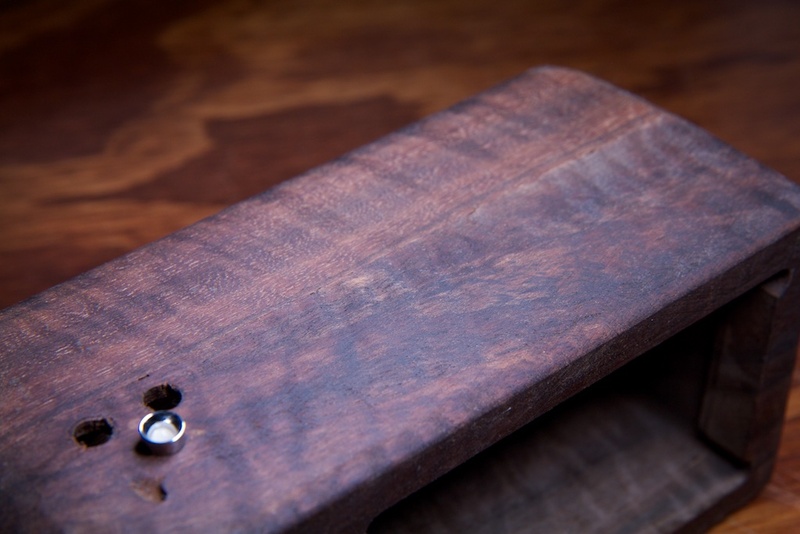 Though there were a few imperfections in the wood, it really had an awesome square look. The only thing I had left to do was treat the outside of the wood to give it a nice durable finish. I bought a bottle of linseed oil and applied it using a rag to all of the outside surfaces. The result is great!